Additional Information: My boat is a Mariner Ranger 26 produced by Mariner in Brazil based on German Frers drawing no 735 from April 79. 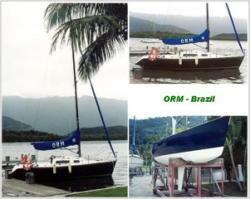 My boat is anchored at the Marinas Nacionais in Guaruja, Sao Paulo, Brazil. The boat has a fractional mast with pair of running stays.